Inflation adjustment, or "deflation", is accomplished by dividing a monetary time series by a price index, such as the Consumer Price Index (CPI). The deflated series is then said to be measured in "constant dollars," whereas the original series was measured in "nominal dollars" or "current dollars." Inflation is often a significant component of apparent growth in any series measured in dollars (or yen, euros, pesos, etc.). By adjusting for inflation, you uncover the real growth, if any. You also may stabilize the variance of random or seasonal fluctuations and/or highlight cyclical patterns in the data. Inflation-adjustment is not always necessary when dealing with monetary variables--sometimes it is simpler to forecast the data in nominal terms or to use a logarithm transformation for stabilizing the variance--but it is an important tool in the toolkit for analyzing economic data. Use of an appropriate price index is important if you are interested in knowing the true magnitudes of trends in real terms and/or if the relevant price history has undergone sudden jumps or significant changes in trend rather than consistent increases over time. However, deflation by a general-purpose index such as the CPI is often adequate for rough estimates of trends in real terms when doing exploratory data analysis or when fitting a forecasting model that adapts to changing trends anyway. Keep in mind that when you deflate a sales or consumer expenditures series by a general index such as the CPI, you are not necessarily converting from dollars spent to units sold or consumed, rather, you are converting from dollars spent on one type of good to equivalent quantities of other consumer goods (e.g., hamburgers and hot dogs) that could have been purchased with the same money. Sometimes this is of interest in its own right because it reveals growth in relative terms, compared to prices of other goods. 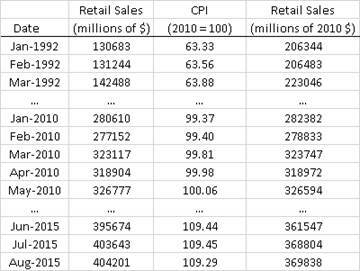 The following screen shot of the spreadsheet shows how the process of adjusting the retail sales to 2010 dollars was carried out here. The U.S. all-city-average CPI was obtained from a public source (Economagic.com) and adjusted to 2010 dollars by dividing it by the average 2010 value and then multiplying by 100. (It is conventional to scale it to a value of 100 in the base year.) 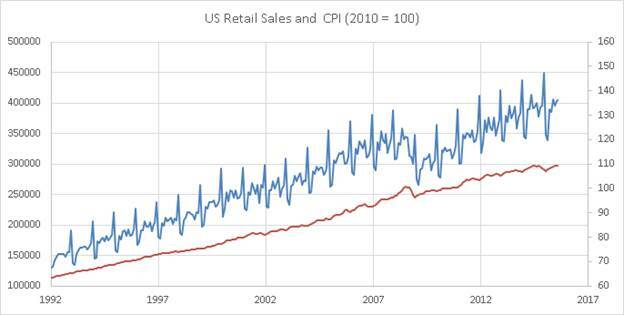 The inflation-adjusted values were obtained by dividing the original sales values by the 2010 CPI and then multiplying by 100. For example, 206344 = (130683/63.33)x100. 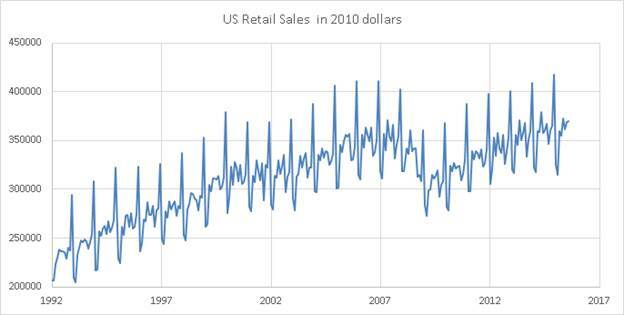 When looking at descriptions of time series obtained from government or commercial data sources, the identifier "$" or "dollars" means the series is in nominal dollars (i.e., not inflation-adjusted). 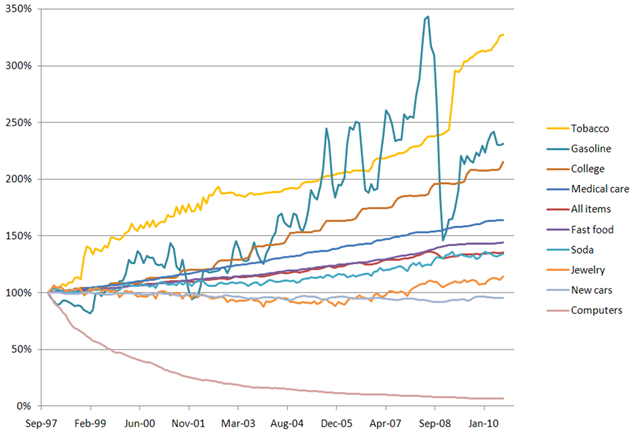 An identifier such as "2010 dollars" or "2010 $" means that the series is in constant (inflation-adjusted) dollars, with 2010 taken as the reference point. For modeling purposes, the choice of a reference point doesn't matter, since changing the reference point merely multiplies or divides the whole series by a constant. To move the reference point to a different base year, you would just divide the whole price index series by the current value of the index at the desired reference date. However, the parameters of a model are easier to interpret if the same reference point is used for all inflation adjustments. The thing you wish to avoid at all costs is having some variables which are inflation adjusted and others which aren't: this will introduce apparent nonlinear relationships which are merely artifacts of inconsistent units. Finally, remember that inflation adjustment is only appropriate for series which are measured in units of money: if the series is measured in number of widgets produced or hamburgers served or percent interest, it makes no sense to deflate. If a non-monetary series nonetheless shows signs of exponential growth or increasing variance, it may be useful to try a logarithm transformation instead.